Through education, events and food services, Saint Mary's College has put Fair Trade front and center on campus. As a recognized Fair Trade College, Saint Mary's College - specifically Mission & Ministry - provides Fair Trade prodcuts at our dining halls, cafes, bookstores and at events. Specifically, $61,697 was spent on Fair Trade products in 2014-15. Additionally, numerous events occur throughout the year to build community and education around what Fair Trade is, it's importance.. and of course, how well it tastes! 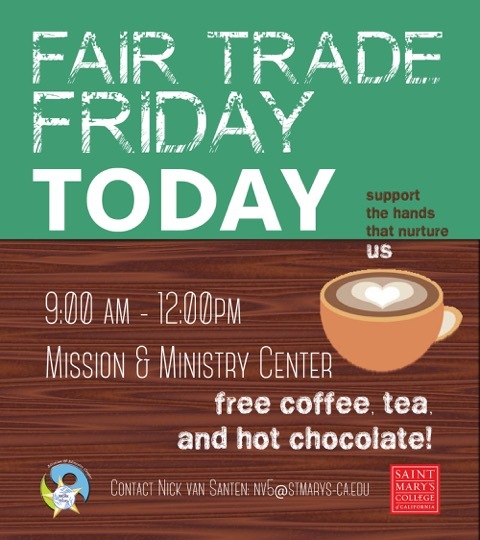 Every first Friday during the academic year, the Mission and Ministry Center hosts a Fair Trade Friday—seven Fridays in total. Although each Friday looks a bit different, there are common themes: fair trade goods for sale, an educational component (i.e. fair trade grocery list, blind taste test, etc) and various vendors invited to share their goods (i.e. Fair Trade Designs). Students who have gone on social justice oriented trips as part of their SMC education present information related to the fair trade theme (i.e. Food Justice in Salinas). We always provide free coffee and chocolate samples for the entire Saint Mary’s Community. On average, we sell roughly 300 dollars worth of products and over 200 staff, faculty, undergraduates and graduate students participate in our Fair Trade Fridays any given month. In Fall 2015, the college hosted a bake-off using AT LEAST one Fair Trade ingredient (Sodexo donated items for students) in our cafeteria during the busy lunch hour. Thirty plus participants of staff, faculty, and students all competed in their select category for $100 gift card offered by a Saint Mary’s social entrepreneur club. Furthermore, our judges included SMC’s chief financial officer, a local restaurateur and a newly elected Moraga city council member. Over 300 participants came to taste the baked goods, hear more about Fair Trade and sign up to further promote Fair Trade at SMC. In Spring 2015, our annual Fair Trade Festival hosted Fair Trade vendors and donations from: Senda, Rebbl Tonic, Clearly Kombucha, Starbucks, Alter Eco, HiBall Energy Drinks, CRS, Green Mountain Coffee and Fair Trade Designs. Sodexo hosted a BBQ to celebrate and our Fair Trade Committee hosted two educational tables with blind taste testing (chocolate and tea), a survey about Fair Trade, and brand/logo recognition. Over 800 students, staff and faculty participated including a reporter from the Lamorinda Weekly, a council member of Moraga and SMC’s President.